My pal Bill has been spinning a couple of times this week and each time he landed a bass. In fact his latest early morning trip was when I'd intended going to the same spot myself but after the alarm went off I tottered downstairs to find that it was pouring with rain - as per the forecast. I went back to bed. Bill was clearly made of sterner stuff than me and well deserved his catch which, as well as the bass, included a couple of reasonable pollack, all caught on a weedless Slug-Gill lure. His email told me that in fact the rain had been fairly light and the sea pretty calm so I kicked myself and promised to try the following morning. The next day I was up and dressed at five-thirty only to discover that the car was coated thickly in frost. Served me right I suppose. I grabbed a jug of water and swilled the ice off the windows before trying to open the boot. It was frozen shut and needed a good heave before I could crack it open and dump the gear in the back. I was armed with my 4Surespin rod, 14lb braid, a metre of 15lb Amnesia and a 6/0 circle hook. The bait was a couple of mackerel heads and a fillet (I'm even mean with my bait you notice). By the time I stepped onto the beach it was 06:30, still pretty dark and the tide approaching high water (an hour-and-a-half to go). First I tried the fillet but clearly it was one of my rubbish soft ones because, after standing for twenty minutes holding the rod with my exposed finger ends in danger of frostbite, I reeled in to inspect the bait only to find that it had fallen off when I cast. Buns!!! I said, before hooking on one of the heads with the big hook just nicked through the lower jaw and out of the tip of the snout - almost a 'hair rig' I tend to think because virtually the entire hook is exposed. By now I'd decided to keep my left hand warm by putting it in my pocket so I lobbed the mackerel head five or six metres out and held the rod in my right hand with the bale arm open and the line under the tip of my index finger (the only part of my anatomy exposed to the icy cold). I looked at my watch. It was ten past seven and the sky was lightening. Not long before I'd be packing in I reflected. I looked at the line hanging from the rod tip. It had bowed round slackly to the left. 'Odd!' I thought. I took a couple of paces back to pick up the bow only to feel a bit of a pull on the line - a fish!!! The left hand came out of my pocket and I could feel the braid streaming out as whatever was on the end of the line set off along the shore. 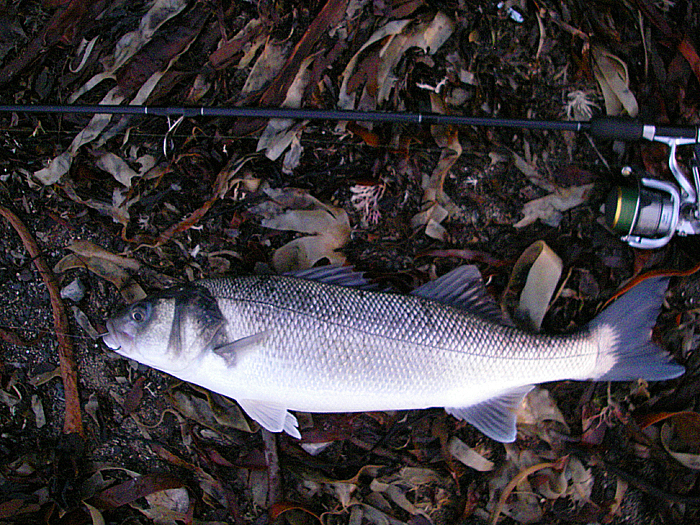 Clearly it had first picked up the bait without me feeling it (despite the braid and the ungloved finger) and moved in and along to give me the original couple of metres of slack. I let it run for a few seconds before closing the bale, the rod swooshed round and it was on. 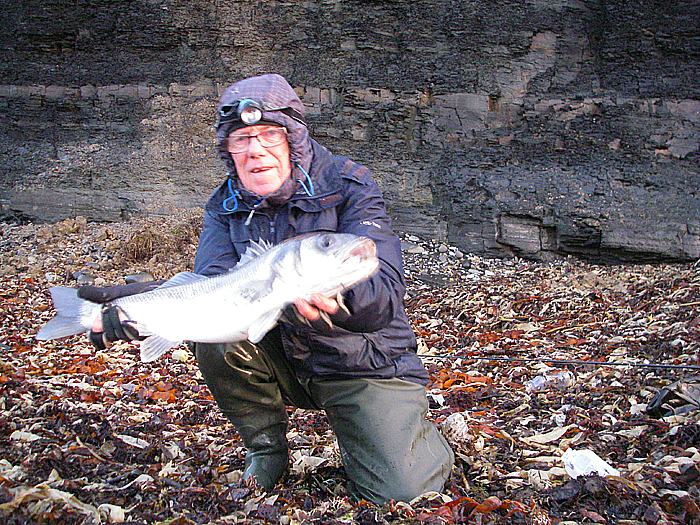 To regain a bit of line I scrambled along the beach after the fish reeling as a went. Then I began to make some headway. 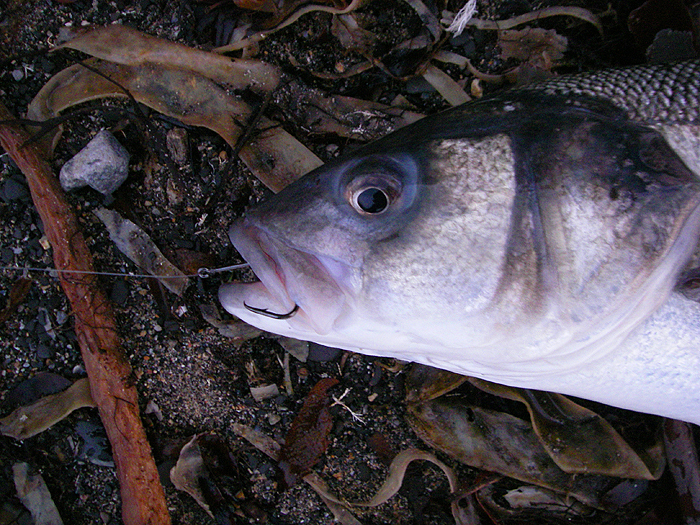 Bass rarely go to ground so as I saw the big swirls on the surface of the sea I felt confident that I'd land it. Sure enough, a couple of minutes and two or three strong runs later I slid my catch onto the shore. It was a beautiful, big, fat bass. I took a couple of pictures and then unhooked it before trying a 'selfie' (which didn't turn out very well - it's always tricky to keep everything still enough in the poor early morning light). I measured and weighed the bass (68cm and 8.5lb) before picking it up by the great shovel of a tail and slipping it back into the water. Away it swam with no hesitation. At this point I decided I was satisfied, chucked the other mackerel head into the sea and went for my breakfast. Honour was satisfied.